A departmental Screening Committee shall be constituted for the purpose of processing the cases for grant of benefits under the ACP Scheme. The composition of the Screening Committee shall be the same as that of the DPC prescribed under the relevant Recruitment/Service Rules for regular promotion to the higher grade to which financial upgradation is to be granted. However, in cases where DPC as per the prescribed rules is headed by the Chairman/Member of the UPSC, the Screening Committee under the ACP Scheme shall, instead, be headed by the Secretary or an officer of equivalent rank of the concerned Ministry/Department. In respect of isolated posts, the composition of the Screening Committee (with modification as noted above, if required) shall be the same as that of the DPC for promotion to analogous grade in that Ministry/Department. In order to prevent operation of the ACP Scheme from resulting into undue strain on the administrative machinery, the Screening Committee shall follow a time-schedule and meet twice in a financial year – preferably in the first week of January and July for advance processing of the cases. Accordingly, cases maturing during the first-half (April-September) of a particular financial year for grant of benefits under the ACP Scheme shall be taken up for consideration by the Screening Committee meeting in the first week of January of the previous financial year. Similarly, the Screening Committee meeting in the first week of July of any financial year shall process the cases that would be maturing during the second-half (October-March) of the same financial year. For example, the Screening Committee meeting in the first week of January, 1999 would process the cases that would attain maturity during the period April 1, 1999 to September 30, 1999 and the Screening Committee meeting in the first week of July, 1999 would process the cases that would mature during the period October 1, 1999 to March 31, 2000. To make the Scheme operational, the Cadre Controlling Authorities shall constitute the first Screening Committee of the current financial year within a month from the date of issue of these instructions to consider the cases that have already matured or would be maturing upto March 31, 2000 for grant of benefits under the ACP Scheme. The next Screening Committee shall be constituted as per the time-schedule suggested above. Ministries/Departments are advised to explore the possibility of effecting savings so as to minimise the additional financial commitment that introduction of the ACP Scheme may entail. The ACP Scheme shall become operational from the date of issue of this Office Memorandum. In so far as persons serving in the Indian Audit and Accounts Departments are concerned, these orders issue after consultation with the Comptroller and Auditor General of India. The Fifth Central Pay Commission in paragraph 52.15 of its Report has also separately recommended a "Dynamic Assured Career Progression Mechanism" for different streams of doctors. It has been decided that the said recommendation may be considered separately by the administrative Ministry concerned in consultation with the Department of Personnel and Training and the Department of Expenditure. Any interpretation/clarification of doubt as to the scope and meaning of the provisions of the ACP Scheme shall be given by the Department of Personnel and Training (Establishment-D). All Ministries/Departments may give wide circulation to these instructions for guidance of all concerned and also take immediate steps to implement the Scheme keeping in view the ground situation obtaining in services/cadres/ posts within their administrative jurisdiction. Subject:- THE ASSURED CAREER PROGRESSION SCHEME FOR THE CENTRAL GOVERNMENT CIVILIAN EMPLOYEES. 2.1 In respect of Group ‘A’ Central services (Technical/Non-Technical), no financial upgradation under the Scheme is being proposed for the reason that promotion in their case must be earned. Hence, it has been decided that there shall be no benefits under the ACP Scheme for Group ‘A’ Central services (Technical/Non-Technical). Cadre Controlling Authorities in their case would, however, continue to improve the promotion prospects in organisations/cadres on functional grounds by way of organisational study, cadre review, etc. as per prescribed norms. to Group ‘C’ and ‘D’ employees) entered into with the Staff Side of the National Council (JCM)] under the ACP Scheme to Group ‘B’, ‘C’ and ‘D’ employees on completion of 12 years and 24 years (subject to condition no.4 in Annexure-I) of regular service respectively. Isolated posts in Group ‘A’, ‘B’, ‘C’ and ‘D’ categories which have no promotional avenues shall also qualify for similar benefits on the pattern indicated above. Certain categories of employees such as casual employees (including those with temporary status), ad-hoc and contract employees shall not qualify for benefits under the aforesaid Scheme. Grant of financial upgradations under the ACP Scheme shall, however, be subject to the conditions mentioned in Annexure-I. 3.2 ‘Regular Service’ for the purpose of the ACP Scheme shall be interpreted to mean the eligibility service counted for regular promotion in terms of relevant Recruitment/Service Rules. 4. Introduction of the ACP Scheme should, however, in no case affect the normal (regular) promotional avenues available on the basis of vacancies. Attempts needed to improve promotion prospects in organisations/cadres on functional grounds by way of organisational study, cadre reviews, etc as per prescribed norms should not be given up on the ground that the ACP Scheme has been introduced. 5. Vacancy based regular promotions, as distinct from financial upgradation under the ACP Scheme, shall continue to be granted after due screening by a regular Departmental Promotion Committee as per relevant rules/guidelines. 6.1 A departmental Screening Committee shall be constituted for the purpose of processing the cases for grant of benefits under the ACP Scheme. 6.2 The composition of the Screening Committee shall be the same as that of the DPC prescribed under the relevant Recruitment/Service Rules for regular promotion to the higher grade to which financial upgradation is to be granted. However, in cases where DPC as per the prescribed rules is headed by the Chairman/Member of the UPSC, the Screening Committee under the ACP Scheme shall, instead, be headed by the Secretary or an officer of equivalent rank of the concerned Ministry/Department. In respect of isolated posts, the composition of the Screening Committee (with modification as noted above, if required) shall be the same as that of the DPC for promotion to analogous grade in that Ministry/Department. 6.3 In order to prevent operation of the ACP Scheme from resulting into undue strain on the administrative machinery, the Screening Committee shall follow a time-schedule and meet twice in a financial year – preferably in the first week of January and July for advance processing of the cases. Accordingly, cases maturing during the first-half (April-September) of a particular financial year for grant of benefits under the ACP Scheme shall be taken up for consideration by the Screening Committee meeting in the first week of January of the previous financial year. Similarly, the Screening Committee meeting in the first week of July of any financial year shall process the cases that would be maturing during the second-half (October-March) of the same financial year. For example, the Screening Committee meeting in the first week of January, 1999 would process the cases that would attain maturity during the period April 1, 1999 to September 30, 1999 and the Screening Committee meeting in the first week of July, 1999 would process the cases that would mature during the period October 1, 1999 to March 31, 2000. 6.4 To make the Scheme operational, the Cadre Controlling Authorities shall constitute the first Screening Committee of the current financial year within a month from the date of issue of these instructions to consider the cases that have already matured or would be maturing upto March 31, 2000 for grant of benefits under the ACP Scheme. The next Screening Committee shall be constituted as per the time-schedule suggested above. 7. Ministries/Departments are advised to explore the possibility of effecting savings so as to minimise the additional financial commitment that introduction of the ACP Scheme may entail. 8. The ACP Scheme shall become operational from the date of issue of this Office Memorandum. 9. In so far as persons serving in the Indian Audit and Accounts Departments are concerned, these orders issue after consultation with the Comptroller and Auditor General of India. 10. The Fifth Central Pay Commission in paragraph 52.15 of its Report has also separately recommended a "Dynamic Assured Career Progression Mechanism" for different streams of doctors. It has been decided that the said recommendation may be considered separately by the administrative Ministry concerned in consultation with the Department of Personnel and Training and the Department of Expenditure. 11. Any interpretation/clarification of doubt as to the scope and meaning of the provisions of the ACP Scheme shall be given by the Department of Personnel and Training (Establishment-D). 13. Hindi version would follow. 15. Subject to Condition No. 4 above, in cases where the employees have already completed 24 years of regular service, with or without a promotion, the second financial upgradation under the scheme shall be granted directly. Further, in order to rationalise unequal level of stagnation, benefit of surplus regular service (not taken into account for the first upgradation under the scheme) shall be given at the subsequent stage (second) of financial upgradation under the ACP Scheme as a one time measure. In other words, in respect of employees who have already rendered more than 12 years but less than 24 years of regular service, while the first financial upgradation shall be granted immediately, the surplus regular service beyond the first 12 years shall also be counted towards the next 12 years of regular service required for grant of the second financial upgradation and, consequently, they shall be considered for the second financial upgradation also as and when they complete 24 years of regular service without waiting for completion of 12 more years of regular service after the first financial upgradation already granted under the Scheme. Hi, I sir I working in state government of Maharashtra judiciary department and I am firstly join in November 2009 as a Junior clerk, then I face department examination of the stenographer L.G. post in December 2010 & I got promotion on Stenographer lower grade in the pay scale 9300 G.P.4300. So what is the fixation excepted in this post please help me. Revision of pension for Survey stream employees of Geological Survey of India, Northern Region, Lucknow is being delayed for no justified reason. Departmental Screening Committee has sought clarification from GSI, CHq, Kolkata after retaining the issue for over a year. 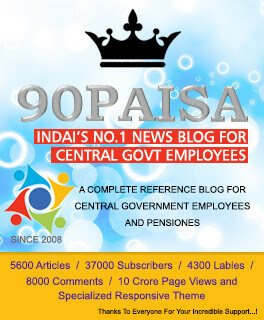 GSI, Central Region has given revised pension to its eligible Survey pensioners. This order is not acceptable to GSI,NR for the reason best known to them. How this order differs from DOPT guideline has not been clarified. How this order is effective is not clarified by the CHq.GSI Portal has no support to get response from feedback comments etc. May god save prevalence of natural justice.